Refill is a grassroots movement to prevent plastic pollution at source by making it easier to reuse and refill your bottle instead of buying a new one. The campaign works by connecting people looking for water to over 14,000 Refill stations across the UK via a location-based app. Anyone can download the free app and find Refill Stations where they can refill for free on the go. Participating cafes, bars, restaurants, banks, galleries, museums and other businesses simply sign up to the app and put a sticker in their window – alerting passers-by that they’re welcome to come on in and fill up their bottle. With more than 14,000 Refill Stations and over 80,000 app downloads, we’ve proven that Refill has the power to create a tipping point in the normalising of carrying a reusable bottle and reducing plastic pollution at source. If all Refill stations are used just once a day, we’re stopping around 4 million plastic bottles at source in a year! When did you first get involved with Geovation? 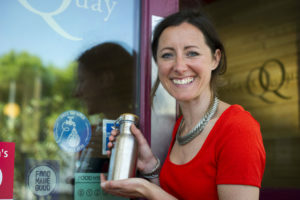 City to Sea, the campaigning organisation behind the Refill campaign, first got involved with Geovation in 2016 when we won a place on the Programme and were offered start-up funding and the chance to develop an app. City to Sea is a non-profit organisation running campaigns to prevent marine plastic pollution at source. By engaging communities, working with retailers and lobbying manufacturers and government, we’re reversing the trend for disposable items in order to safeguard our seas for the future. Our vision is for the world’s waterways and coastlines to be strewn with sticks, sand and seaweed … not plastic! Natalie Fee, founder of City to Sea. Before the Geovation Programme, we knew we needed an app, but we didn’t really know where to start or how to fund it. Through a mixture of business and technical expertise, the Geovation team helped get us on our way. Two years later we’re a thriving Community Interest Company (CIC) with 15 staff, over 80,000 app downloads, hundreds of volunteers and over 100 Refill schemes in the UK. We now have over 14,000 Refill stations in the UK and are working with high street chains like Costa, Pret and Starbucks. We are looking to transport hubs like Heathrow Airport to pioneer change in the aviation sector, as well as encouraging Network Rail to reintroduce fountains into train stations. Ultimately, without the app, we wouldn’t be able to connect people with Refill Stations. Every Refill means one less single use plastic bottle in circulation, which could potentially end up in our oceans and environment. 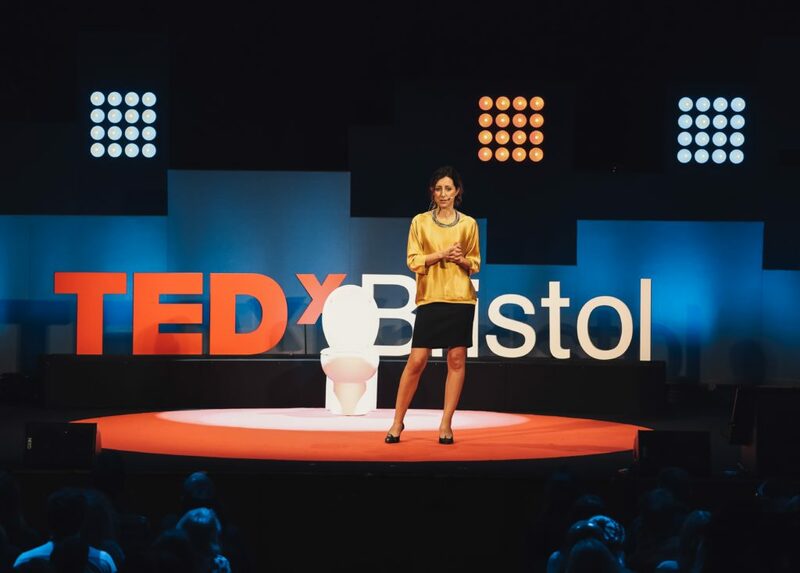 Founder Natalie Fee talking at TEDxBristol. Refill aims to become the world’s leading app for refilling water bottles on the go, wherever you go. Ultimately, we want to disrupt the current social norm that we need to buy bottled water when ‘drinking on the go’ and make it normal for people to carry a reusable bottle when they’re out. We recently launched our first National Refill Day which made a huge splash online and in the media. It reached over 30 million on social media and received support from Sadiq Khan, the Mayor of London, Environment Minister, Michael Gove, Thérèse Coffey and DEFRA, as well as celebrity supporters such as Hugh Fearnley-Whittingstall. We’ll be making this an annual event and have plans to take it international in the pipeline. We’ve got a huge amount of interest to expand the Refill campaign to Europe and the rest of the world. There are Refill schemes popping up everywhere from Australia to Iceland! We’re currently exploring funding models, partners and licensing to enable Refill to become ‘the TripAdvisor of tap water’ as someone once described it. Our mission is to stop plastic pollution at source on a global scale, and the Refill app puts the power to do that in everyone’s hands. Interested? Find out more about the Refill movement here.